The Fish Lady, Inc. is Barbara Johnson. Barbara creates and cares for the most stunning, extraordinary Koi ponds in the greater Los Angeles area, including Hollywood and Beverly Hills. 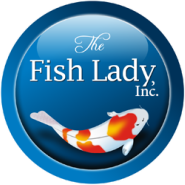 With over 30 years experience in Koi Pond design and maintenance, it is no surprise how many Koi Pond lovers come to The Fish Lady for Pond Consultation and Maintenance. FISH FIRST and what is BEST for them. ...a Koi Pond is much more than a backyard water garden feature: It is a living, breathing, Eco-system which requires the expertise of a Pond Professional. Our pond maintenance is custom fit for your needs. We bring our preferred supplies and maintenance equipment to ensure the health, beauty, and longevity of your Koi Pond.